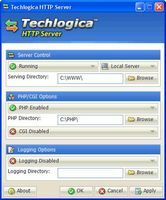 Our Apache Server GUI will help you to configure your Apache Server the way you need it within minutes. Stop fighting with documentation and start talking to your Apache Web Server. Perfect for both novice administrators and seasoned veterans alike, Apache Admin makes configuring and tuning your web server a breeze, all from the comfort of your Windows desktop. Apache Admin provides the most powerful and consistent method of creating your Apache Web Server configuration files. 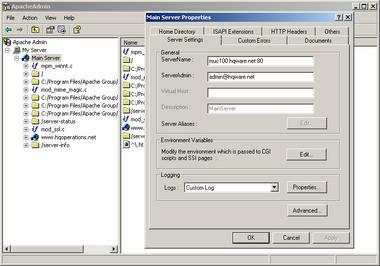 All major Apache Web Server configuration settings can be changed though the Apache Admin interface. 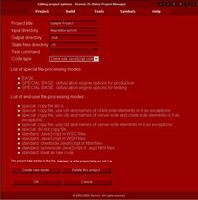 Apache Admin makes extensive use of single click entry of parameter values (for Apache Web Server Directives) through an easy-to-use, consistent pull-down menu interface. This has the advantage of ensuring that the HTTPD.CONF file built for your Apache Web Server has correct syntax, without typing in values manually, saving you hours of manual data entry and painful error-checking and debugging. Apache Admin provides powerful validation of configuration files by utilizing the syntax-testing built-in option of Apache Web Server. Additionally the tree-structure representation and logical grouping of the Apache Web Server directives gives the Apache Admin user full control and oversight of the configuration parameters required for correct assembly of a valid httpd.conf file. 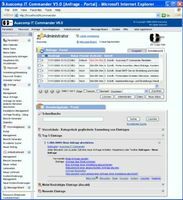 Apache Admin is an MMC (Microsoft Management Console) snap-in software tool, with the advantage of enabling the configuration of your Apache web server in the same consistent approach as your other Windows management applications. If you have ever configured Microsoft Internet Information Server (IIS) then you'll feel right at home!